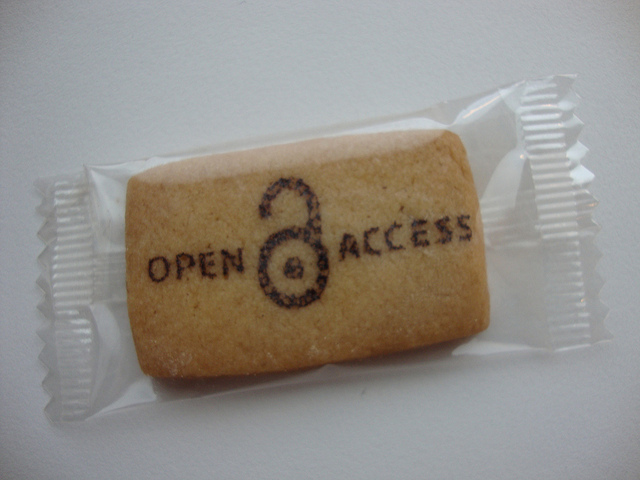 Happy Open Access Week, everyone! Though maybe it’s not the happiest of weeks this year… Last Friday the news broke about the appeal of the Georgia State University e-reserves case. It looks like many of the rulings in favor of fair use from the initial suit may be overturned, though it’s not certain exactly how things will shake out yet. Kevin Smith, Scholarly Communications Officer at Duke University, shared a few early thoughts on his blog, and Nancy Sims, Copyright Program Librarian at the University of Minnesota, wrote a longer post discussing the ruling. I’m sure we’ll see much more conversation about this in the coming weeks. I’m disappointed about the ruling, for sure, but in some ways this just makes my support of open access and open educational resources that much stronger. The academic and textbook publishing model we have cannot be sustained. Students have already pulled way back in buying textbooks and required readings for their courses, and libraries can’t purchase these materials (or pay copyright fees) infinitely or perpetually. I work at the City University of New York, the largest urban public university in the U.S. Forty-seven percent of CUNY students live in households with an annual income of less than $25,000. My library does purchase textbooks for reserve and they are used so heavily by our students that many are beyond repair by the end of the academic year. Textbooks can represent a significant portion of students’ expenses, any many of them just can’t buy the books. As these forces continue to converge, I’m hopeful that faculty and administrators will be ever more receptive to open access and open educational resource advocacy. We’ve been talking about this for many years at my college and university, and while it’s sometimes frustrating to have to say the same things over and over again, we’re definitely starting to see results. Some are department or college level initiatives, like the precalculus textbook that two members of my college’s Math department wrote. It’s available as a printable/downloadable PDF (which students can print for free in the library and other computer labs on campus), or as a print on demand book for $13.00. All sections of the course are now using the book, and the authors are sharing it throughout the university. At the university level, this fall the central library office at CUNY is sponsoring an OER course on OERs (so meta!). The course runs online over two weeks and includes materials and discussion, and aims to teach faculty how to create or curate OERs for their own courses. Faculty receive a small stipend for completing the course. The response to this course offering has been huge, and there’s already a waiting list for the next time the course will run. I was delighted to learn that the faculty response and interest from my college was particularly strong, and added those folks to my mental list of folks who might be open to further advocacy efforts or partnerships with the library. So even with the disappointing news from Georgia, I’m feeling optimistic this Open Access Week. And I want to share my appreciation for everyone in libraries who does this hard work of open access and open educational resource advocacy all year round, not just for one week. Thank you, and keep up the good work! Many libraries grapple with whether to buy textbooks to put on reserve for students to use. At my college we do acquire textbooks, though of course we purchase many other books for circulating use as well. I’ve usually thought about the textbook issue from the perspective of the library, for example, our materials costs vs. the relative perishability of these books. Textbooks also have an impact on our library faculty and staff: our students assume that the library has their textbook on reserve and and sometimes get frustrated when we don’t, and can take their frustration out on our library faculty and staff. But I’m starting to think that our offering many textbooks on reserve for students to use is deflecting many of the core issues with textbooks. Recently we’ve heard our faculty lament more and more often that their students are not buying the textbook for their classes. This is not surprising: textbook prices are high and growing, and I’d guess that one of the main reasons students don’t want to buy their textbooks is that it seems like a lot of money for something they may only use in one class, especially for classes that aren’t in their major. We are certainly helping our students when we provide textbooks on reserve for them to use, which is an important part of any college library’s mission and goals. But we’re also allowing faculty to sidestep a major and thorny issue in academic publishing: the extremely high and continuously increasing cost of textbooks. Don’t get me wrong, I think there’s definitely value in textbooks. Writing about complex subjects and disciplines in a clear, concise way that’s appropriate for undergraduates, especially first year students, is challenging. A good textbook can be very useful for faculty teaching and students taking a course. Some textbooks are not unreasonably priced, either. But for far too many topics it seems like the textbook market is out of control, with new editions every couple of years, and costs into the hundreds of dollars. Open access textbooks and educational materials are one way to tackle these thorny textbook issues. As we get closer to Open Access Week I’m preparing for a faculty workshop we’re planning at my library, and am beginning to read about encouraging experiments with open access textbooks and other curricular materials by librarians and faculty. Is your library working on an open access curriculum project with faculty? Please share your thoughts and lessons learned below.